Human started with just wheels for travelling & transportation purposes at first. Then came bikes, cars & trains which could be driven on land. The next difficulty was to overcome the vast oceans & seas which led to invention of ships. Engineers are still finding ways to make today’s vehicles more better & efficient even though we have achieved success in almost every mode of travelling & transportation. One of the extraordinary machine in history of vehicles is hovercraft. Lets see how does a hovercraft work ? Break it into 2 parts & there you go – a craft OR vehicle which hovers (levitates). 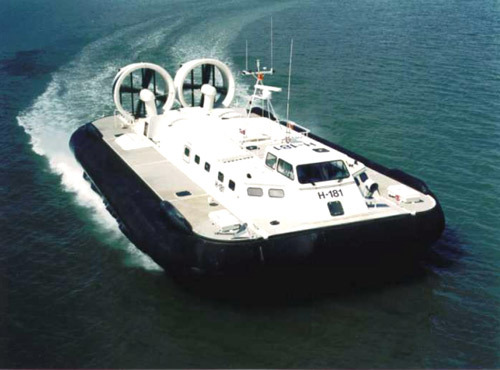 A hovercraft is also called as ACV (Air Cushioned Vehicle). What’s the best part – a hovercraft is capable of travelling over land, mud, ice & other surfaces too. An Englishman named Christopher Cockerell developed and patented the first official hovercraft in 1950s. 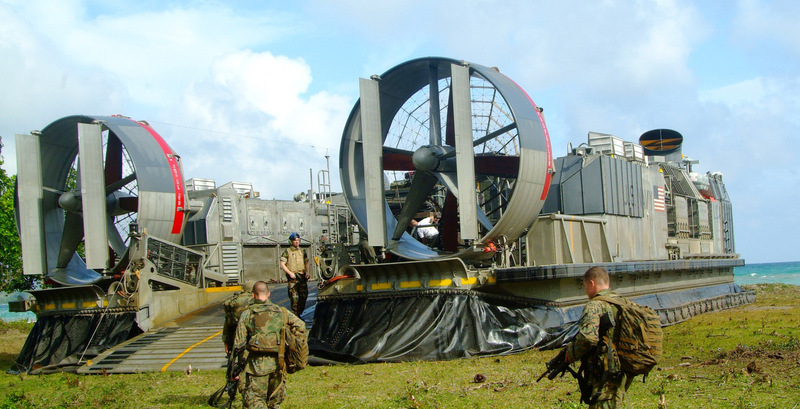 A hovercraft has 1 giant or 2 fans mounted centrally which helps to lift it above the surface. Front side is the cockpit where the pilot drives the vehicle. A hovercraft also has 2 another secondary fans located at the backside of the craft along with rudders. Mainly a diesel engine in the mid-rear part drives the propellers. A hovercraft is composed of a hull that can float in water and is carried on a cushion of air retained by a flexible ‘skirt’. The hull is typically made of aluminium, fiberglass or plastic or a combination of them. The hovercraft skirt is made from a flexible waterproof material such as neoprene-coated nylon. It allows the vehicle to travel smoothly over small obstructions without damage . So how does a hovercraft work ? When we start the engine, the central giant fan or propeller starts to blow air below inside the hull. A large amount of air gets trapped underneath the craft in a few seconds. Now when more air is forced into the air cushion formed below the hull, high pressure region is created due to which the hovercraft gets a lift thereby the air escaping through the holes around the outside of the platform. How do hovercrafts move forward & take turns ? The 2 secondary fans or impellers are used as thrusters to move forward. Also the rudders behind them help to change the direction of flow of air due to which a hovercraft is able to take turns. Either 2 separate engines are used for thrusters & central fan OR both are driven by the same engine with the help of gears. Does the ground surface effect the speed ? Yes, it does a bit. The main issue which hovercraft has solved is FRICTION. As a hovercraft levitates above the surface, there remains no friction between the skirt & land. However, it will run slower on rough land or terrain compared to ice. The hovercraft will travel faster on ice as it has very less friction due to very smooth surface. Rough sea waves may slow down the craft. So weather & type of land may affect the speed of a hovercraft. The average speed of a hovercraft is 35 mph (56 km/h). Bob Windt, a member of the DiscoverHover advisory board and designer of the DiscoverHover One hovercraft, holds the Guinness Hovercraft World Speed Record of 85.376 mph (137.40 km/h), which he achieved in 1995 on the Rio Douro River in Peso da Regua, Portugal. The SR.N4 (Saunders-Roe Nautical 4) as the largest hovercraft built to that date, designed to carry 254 passengers in two cabins besides a four-lane automobile bay which held up to 30 cars.The first design was 40 metres long & weighed 193 tons which could cruise at over over 60 knots (111 km/h).